Heart Failure - Becky Dorner & Associates, Inc. 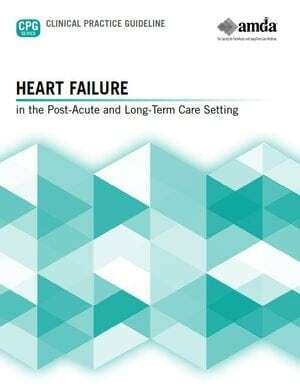 The AMDA Clinical Practice Guideline Heart Failure in the Post-Acute and Long Term Care Setting is intended to help clinicians recognize, assess, and manage patients with heart failure. Heart failure is a complex clinical syndrome that results from any structural or functional disorder that impairs the ability of the ventricles to fill with or eject blood at a rate needed by the body. It is a progressive disease associated with decreased life expectancy. About 10 per 1000 individuals aged over 65 will develop heart failure, and it is a common condition in post-acute care settings. Nutrition assessment can help identify potential interventions for patients with heart failure in the post-acute and/or long-term care setting. Know the symptoms of heart failure. Understand lifestyle modifications that can help manage/treat heart failure in the post-acute/long-term care setting. Understand the role of weight changes in monitoring and managing heart failure.